Two young women find themselves trapped in a cage in shark infested waters. The traditional models of film distribution are currently being turned on their heads. Big budget productions headlined by A-list box office draws like Will Smith and Brad Pitt are bypassing cinemas and heading straight for that 4" screen you keep losing behind your couch. Conversely, modest genre movies boasting lesser stars are receiving theatrical releases where they might have gone straight to video not so long ago. 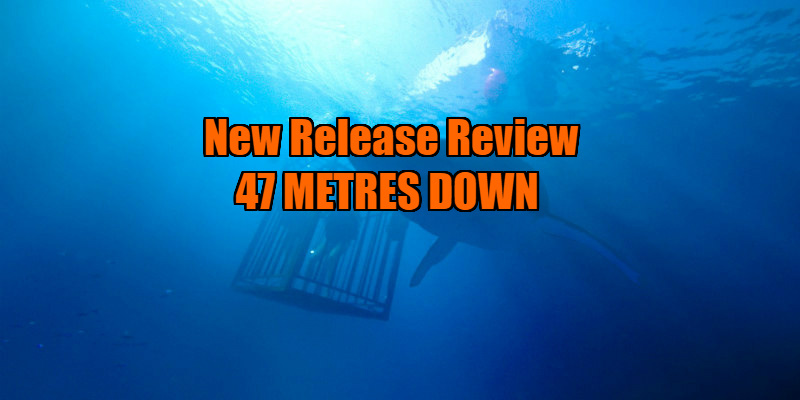 Survival thriller 47 Metres Down was all set to hit DVD stores last summer until The Shallows proved a surprise hit. Copies of the DVD, then titled In the Deep, were recalled (though some can still be found floating around Ebay), and the movie was held back for a summer 2017 release. It's a decision that has considerably paid off, with the film making its $5 million budget back close to tenfold on its US release. As with The Shallows, the female protagonist of 47 Metres Down has travelled to sunny Mexico in an attempt to put recent troubles behind her. Lisa (Mandy Moore) has been dumped by her boyfriend, who claims she was too 'boring' for his taste, and heads South of the border with her younger daredevil sister Kate (Claire Holt), hoping to bring back photographic evidence that will prove to her ex that she's capable of letting her hair down. I doubt anyone in the audience will be rooting for this relationship to resume, but there's no getting through to poor Lisa. On a drunken night out, our gringettes meet two young local men, who tell them about an American captain (Matthew Modine) who offers intrepid tourists the chance to submerge in shark infested waters, protected only by a cage. Lisa shows a lot more sense regarding this offer than in her relationship, dismissing it immediately as insanity. I mean, we've all seen Jaws, right? Kate jumps at the chance however, and after much arm-twisting, herself and Lisa are being lowered into the big blue. It's all fun and games until the cable snaps and the cage plummets to the sea bed, 47 metres below the surface. The girls face several immediate problems. There's the sharks, made all the more hungry by the chum the lads above have playfully tossed into the water. There's the rapidly depleting supply of oxygen both girls are left with. There's the problem of attempting a swift swim up to the surface, which would cause a severe case of the bends. And there's the girls' uncertainty as to whether this bunch of strange guys they just met can be trusted to help them. 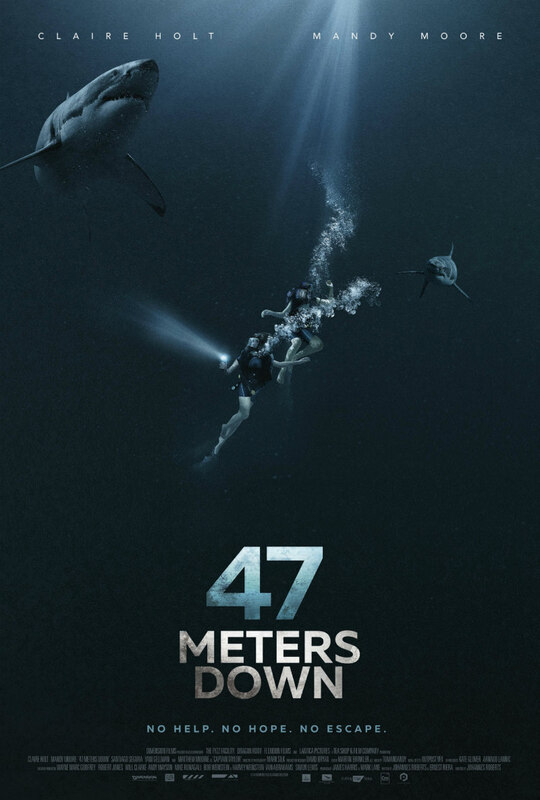 The full title as presented in the opening credits reads Johannes Roberts' 47 Metres Down, a sign that the director isn't short of self-belief. The filmmaker arguably most famous for insisting on his name appearing above his films' titles is John Carpenter, who seems to be one of the primary influences on Roberts' film. Lisa is a descendant of the classic final girl trope established in Carpenter's Halloween, beginning the movie as a timid, self-doubting mouse, and gradually evolving into a roaring tiger as her hellish ordeal progresses. Roberts exploits the black and blue darkness of the ocean in a similar way to how Carpenter used shadowy suburbia in his '78 film, and there's a fantastic jump scare that recalls that unforgettable moment when Michael Myers appears from the darkness of a bedroom. Elsewhere, Aliens is given a nod with a shocking reveal involving a lit flare. Roberts finds enough ways to increase the stakes of his limited scenario without ever straying into laughably unrealistic territory, and his work here is a big step up from the second rate genre movies he made in his native England (F, Storage 24) and his atrocious American debut The Other Side of the Door. He's aided immensely by the presence of Moore, whose role asks her to communicate emotion almost exclusively with her eyes - it's a challenge to any performer, but Moore pulls it off with an ease that will go unnoticed by most viewers. Props must also go to the effects department for creating what may be the most convincing sharks we've seen on screen to date. 47 Metres Down is in UK/ROI cinemas July 26th.